Apple watch brings some new exciting features as the new update watchOS 4 brings a bunch of new additions and enhancements. The new update brings three new watch faces: Toy Story and a Siri watch face that features a proactive timeline. It will show new and relevant information as the machine learning algorithm adapts to the user’s habits. Playing controls during workout. The new update also improves Workout algorithms for tasks such as swimming, high-intensity interval training, and also supports multiple workouts in a single session. You can now automatically sync Apple Music playlists as well as frequently played music and recently added ones. It’ll go on sale starting September 22.Before updating your Apple Watch to watchOS 4, you will need to update your paired iPhone to iOS 11, which has also begun rolling out worldwide. For downloading, there are some preconditions to be fulfilled.Your Apple Watch will also need to have at least 50 percent battery charge to start the update. 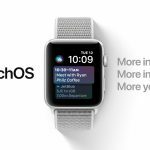 Your iPhone will need to be on Wi-Fi and in close proximity to the Apple Watch while updating to watchOS 4.Once all this is done, launch the Watch app on your iPhone and head to the My Watch tab and then General > Software Update. Enter the Watch passcode if prompted and then follow the prompts from your iPhone. Now coming on tvOS 11 that brings new features including Home Screen Sync which lets users rearrange apps on one Apple TV , AirPlay 2 will make to tvOS 11 in the near future and will allow for multi-room AirPlay from iOS and HomePod. and full support for Airpods which means Apple TV owners will now see AirPods listed under speaker options if they happen to be nearby. For updating Launch the Settings app on the Apple TV and navigate to Settings > Systems > Software Update. You can then proceed to download tvOS 11 following the on-screen prompts.As the new OS is out, you can expect the app to hit the Apple TV App Store soon!